CBD Pure is yet another brand name that claims to sell CBD hemp oil that will boost your mental and physical health. By now you should be aware that CBD oil made from hemp is making significant waves in the alternative medicine industry. As its THC content is below 0.3%, it is legal in all 50 states. However, it is important to note that dietary supplements don’t have FDA approval and most brands ensure there are multiple disclaimers with their product. On this site, our goal is to help you find the purest CBD hemp oil from reputable companies; so let’s see if CBD Pure deserves to be near the top of your CBD shortlist. CBD Pure comes from a company called Nutra Pure LLC that operates out of Washington, Vancouver, in Canada. The firm also has an office in England. Oddly enough, there is relatively little information pertaining to the company’s foundation, board members, etc. online. What we do know is that the company uses industrial hemp from Colorado which ensures its products are made from organic content. We were extremely encouraged to discover that CBD Pure’s hemp oil is backed by a certificate of analysis from SCLabs. You can check out the certificate and discover the lack of harmful chemicals and impurities. 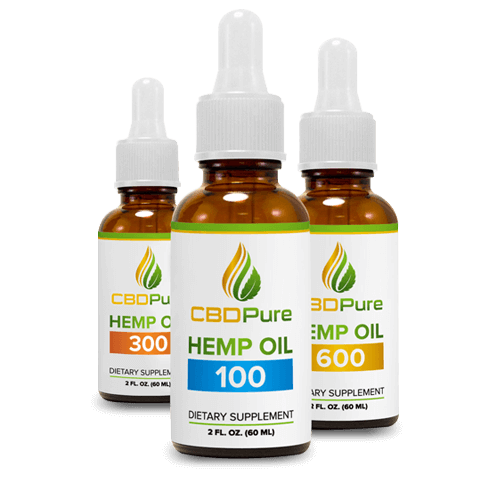 At the time of writing, CBD Pure only sells one product: Hemp Oil Extract. It is available in 100mg ($29.99), 300mg ($54.99) and 600mg ($79.99) sizes and as you would expect, the largest container offers the best value for money. CBD Pure’s hemp oil contains naturally occurring cannabidiol, cannabinoids, and terpenes. As well as using organic hemp from Colorado, the company utilizes cold pressing and CO2 extraction to get the oil from the plant. Interestingly, the hemp oil is manufactured in an FDA-approved lab, and the company follows strict processing standards. It is reassuring to know that while the actual product isn’t FDA-approved, it is at least produced in a high-quality facility. It is important to note that the 100mg bottle provides you with 3.3mg of CBD per daily serving; the 300mg bottle offers 10mg while the largest version offers 20mg per day. As a result, it is best to purchase the largest version if you suffer from chronic pain. It is also reassuring to know that you are protected by a 90-day guarantee. According to CBD Pure, if you are not happy with the results, you can send the order back within 90 days, and the company will fully refund the purchase price. The oil comes with a dropper, and you are supposed to take 1g (half a dropper) twice a day. Simply drop the oil under your tongue and hold it there for up to 60 seconds. CBD Pure doesn’t make especially bold claims about its products; it prefers to let its customers do it instead. You can find a number of positive testimonials on the company website. For example, Tyra in Georgia is thrilled at how the hemp oil helped her son. Zhu from California said she wished she had used it sooner and admitted that she put off taking CBD oil for years in the mistaken belief it would get her high. We also read one remarkable story where CBD Pure hemp oil helped improve a person’s memory in what was a life-changing situation. As well as providing relief from stress and depression, CBD Pure hemp oil is an effective painkiller. Instead of becoming addicted to prescription medication, you can use this oil to relieve the pain symptoms naturally. We are not surprised to learn all this. After all, CBD Pure’s product comes from naturally grown organic hemp which is completely free from pesticides and chemicals. Although research on CBD is still at an early stage, studies published in journals such as Therapeutics and Risk Management (2008) and the British Journal of Clinical Pharmacology (2013) suggest that CBD’s impact is real. While the 2008 study is contentious, the 2013 study appears to be on solid ground. As always, we recommend purchasing this product from the official CBD Pure website. We also advise you to leave a review online if you get the chance because there are relatively few customer reviews available for what is apparently a very popular product. Although the product comes from industrial hemp grown in Colorado, CBD Pure does not ship internationally, including Louisiana, Kentucky, Indiana, and Arkansas. The CBD oil market has exploded in the last few years, and there are now hundreds of suppliers selling products derived from industrial hemp. The ‘food supplement’ status of CBD oil means that companies have spotted yet another opportunity in the multi-billion dollar supplement industry. CBD oil is unquestionably one of the most exciting supplements in recent times as a growing body of science is backing it as an all-natural alternative to potentially addictive prescription medication. The growth of the market, unfortunately, means that a few products of dubious quality will slip through the net. Fortunately, we believe that CBD Pure qualifies as a reputable company that sells a product with potential. Its CBD hemp oil is certainly one of the better versions around. We would recommend trying the smallest version first, and if you feel benefits after a month, perhaps you can opt for the 6-month supply. I bought this and the taste is not nice at all! I did think the effects were great but I cannot stand the flavor. Does anybody have any recommendations on how i can consume it to mask the flavour? CBD Pure has been around for ages and always been a reliable place for me to get high quality CBD! I used to have severe depression and anxiety as part of PTSD, and after 3 years of using this CBD i can honestly say i hardly ever need it now! An honest CBD business that is worth your time! I was drawn to CBD Pure because of their understated sales technique. I have been using CBD products for 5 years to help with my chronic back pain, but so many companies boast to be the best and I have found that many have fallen short of their claims. This company doesn’t do that, there is no over-exaggeration, and the comments from other users really stand up for the company. Would highly recommend, great service and quality CBD! I would love to get this product in Kentucky, my friends love it! I live in Kentucky and have been desperate to get my hands on some of this Pure CBD. I have a few family and friends dotted around America who have used many CBD products before, and have always ended up with this company. I have suffered from severe health issues since I was diagnosed with diabetes, and have done a lot of research into how CBD could help. After hearing so much wonderful stuff about this company, I am more keen than ever to get some but up til now they do not ship to where I am. Based on my loved ones reviews, I would say that if you can, you should try this brand! Well priced, and fantastic quality! I first tried CBD Pure’s hemp oil in the smallest size, having tested a few before, and had even fallen into the trap of buying the most expensive size before knowing if it was a good product, I wanted to be sure this was worth it. I have severe social anxiety, which has only gotten worse over the years, before finding CBD Pure I would rarely leave the house, maybe two times a month I would step foot outside and this was always suh a challenge. I found the results of the hemp oil in 100mg to be really impactful, I felt a difference within a few days and every time I used it the effects came faster. I now purchase the 600mg bottles which lasts me a long time, and I have been bold enough to start therapy too. I can now go outside pretty much every day, and I feel this is massively down to this CBD Product.